A farmer earns Rs. 50000/year when the monsoons are kind and the harvest is good. This year was not so good with drought and harsh summer. Lakshmi Narayana suffered without any harvest, but his struggle did not stop there. 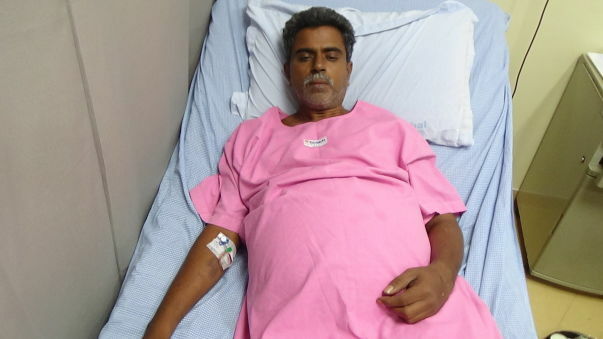 He has been diagnosed with liver disease, and cannot afford treatment. Without a solution, Lakshmi Narayana will lose his life. "A villager is unaware of what happens in the outside world. We are always worried about survival. It is about making a living. When a disease strikes, we lose hope because there is never any money to help us make it." Lakshmi Narayana is from Lingojipalli village, of Cumbum Mandal, Prakasham district in Andhra Pradesh. He lives with his wife, 3 children, a brother and his elderly mother. Venkat Narayana (brother) and Lakshmi Narayana toil day and night in the fields to feed the family. "Back in September, my brother's hands, legs, and stomach began to swell. Suddenly there was water accumulation and he was in a lot of pain. He was unable to move." The brothers went to a gastroenterologist referred by a local doctor. 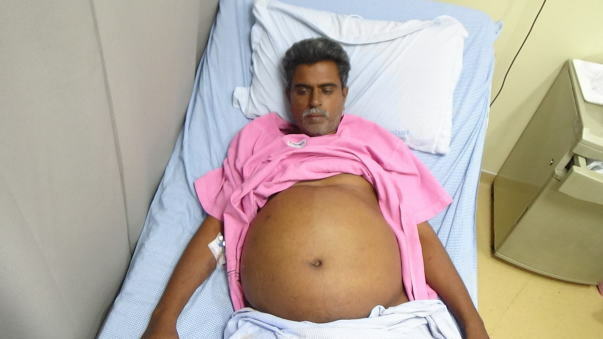 He examined and diagnosed Lakshmi Narayana with liver cirrhosis. At the time, he was prescribed medication and sent home. In a few days, the problem got worse. 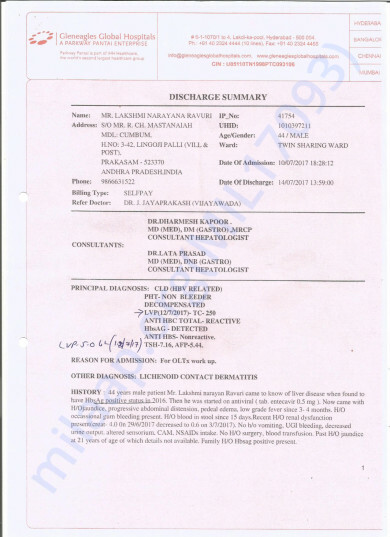 They went to another hospital where after a battery of tests, Lakshmi Narayana was prescribed more medication. His condition turned serious and as the pain got unbearable, he switched hospitals yet again right in time to know that he wouldn't survive without a liver transplant. 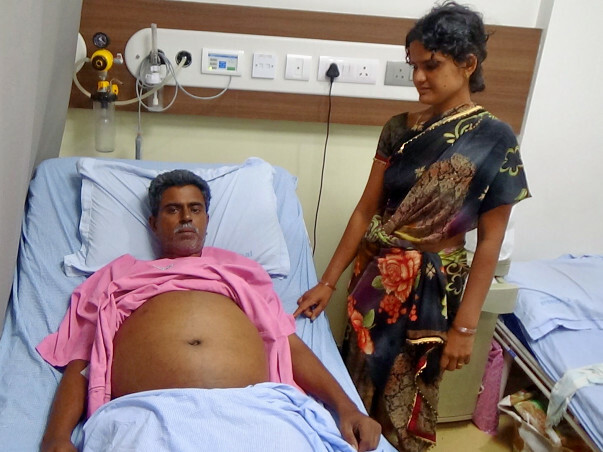 Lakshmi Narayana is not on the hospital bed waiting for fate to decide whether he lives or dies. His brother is struggling to meet the medical expenses and also arrange for the funds that can go towards his surgery. So far, they have spent Rs. 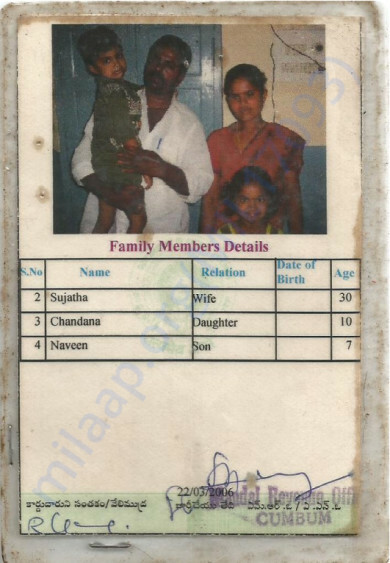 5 lakhs from mortgaging the land that was their only source of income. Now, the family feels frustrated begging everyone they know for Rs. 10 or Rs. 20 to amass Rs. 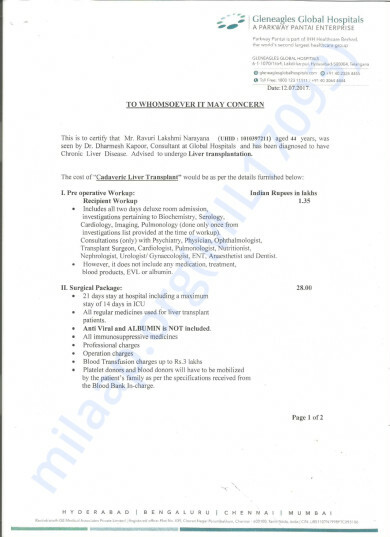 35 Lakhs for the surgery. "He has 3 children. He was going to educate them and send them out of the village so they didn't have to be like us. Now, if they lose him, they would end up following in our footsteps. He is in so much pain. I don't know what to do." Your contribution can save this man, and his struggling family. I am sincerely thankful to you all for your kind hearted contributions. It help me a lot and gave an extreme financial assistance over the period of my liver transplantation treatment. Currently I am very fine also my health condition also good.